the skinmate manicure station consists of a compact storage tower with four pull-out trays, two of which are divisional and the tower has a pull-down shutter, it has castored feet and an adjustable leg, incorporated into the work surface is an extractor fan with filter and grill. 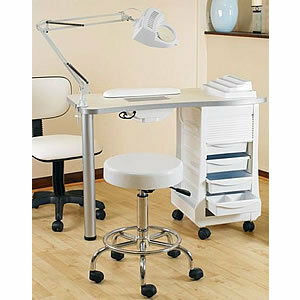 The station comes complete with a client armrest, nail lamp with G-clamp and nail polish rack. all finished in white. Dimensions 48cm depth, 98cm width and 74cm height. Please note stool and chair shown are not included.